This has been one of the most transformational life-changing practices on my journey. I have been blessed by my spiritual teacher to have this awakened and enlivened in me. One of my joys is the chance to share this with others. I offer 30 minute online coaching sessions – a great way to get started in your practice especially if this is new to you. Please get in touch if the times offered don’t suit your schedule. 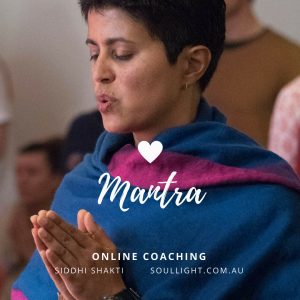 You can also access some mantra recordings in the online shop to assist you with your practice. Great if you want to chant along, or play it as a space clearing/vibration setting sound track in your home or office. Oṁ Gaṁ Ganapataye Namaḥ: a mantra invoking the energy of transformation to move through perceived obstacles. Elemental Balance Bīja Mantra: bīja sounds for each chakra to balance the 5 elements. Gāyatrī Mantra: a prayer to the Divine light illuminating all realms, to illuminate our intellect. You can also access my online courses should you be interested in self-paced learning of some of the longer prayers of light: Learn the Durga Suktam | Learn the Medha Suktam | Learn the Sri Suktam.